This page guides you through updates in recent dotMemory and dotMemory Unit releases. 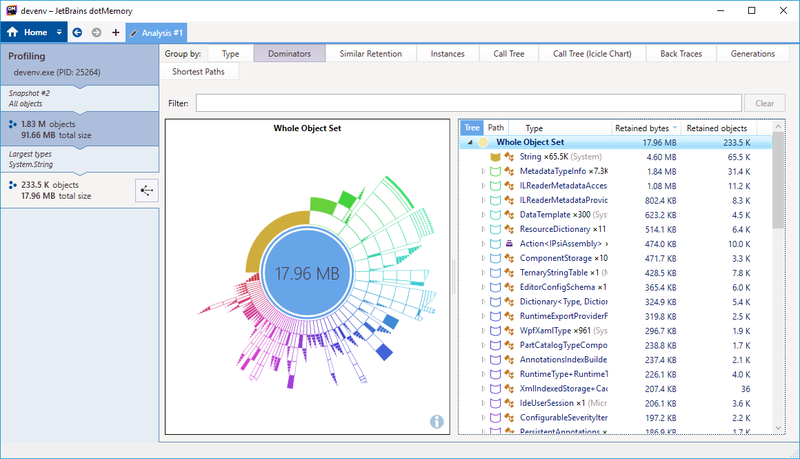 Highlights include a command-line profiling tool, support for .NET Core applications, and analyzing memory dumps. The profiling controller gets a new condition for taking a snapshot: Get a snapshot if total memory usage exceeds X MB. Click on the graph to get exact memory data at a specific time point. 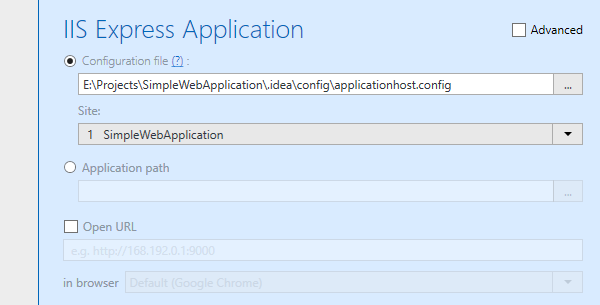 Now, the default way to profile a web app hosted on IIS Express is to provide dotMemory a applicationhost.config file. 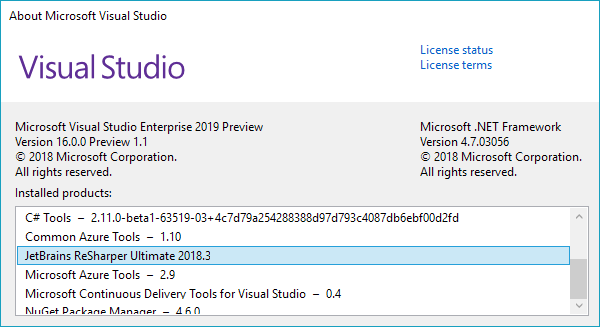 dotMemory 2018.3, along with other products of the ReSharper Ultimate family, can now be installed into Visual Studio 2019 Preview 1.
dotMemory integrated in Visual Studio gets more profiling capabilities. 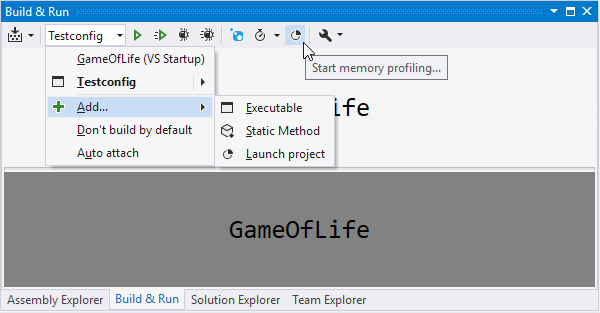 Now, you can profile not only your startup project, but any run configuration: a startup project, an arbitrary executable, or even any static method. The timeline is now available for all types of applications including .NET Core, ASP.NET Core, IIS-hosted web apps, and others. The timeline gets a new Allocated in LOH since GC chart. 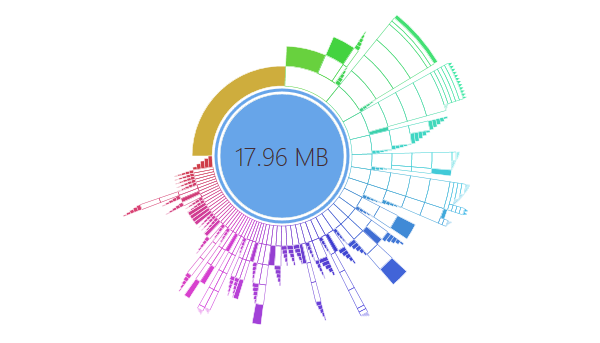 The chart shows instant memory allocation to the Large Object Heap and can be very helpful in detecting excessive allocations of large objects. To learn more, see How does my app allocate to LOH? Find out with dotMemory 2018.2! The 2018.1 release brings multiple minor user interface improvements. The most significant change is the reworked Analysis Subject panel. Now, it's much easier to navigate your analysis path. Make your search more efficient when searching for particular objects in a memory snapshot! Now, you can use special symbols to create complex patterns. For example, adding !a will exclude all arrays from the result: !a str will return String but not String. 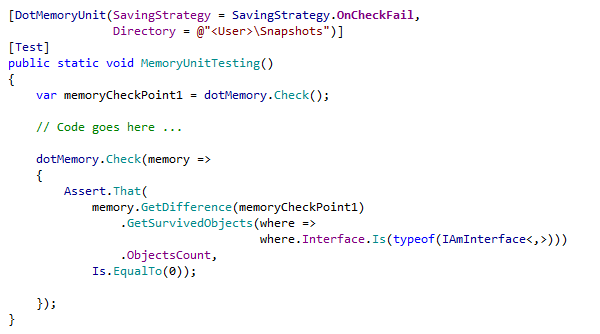 dotMemory Unit now fully supports .NET Core unit tests. Please note that support is currently only available on Windows. You can now import raw Windows memory dumps (typically, you get them using Task Manager or Process Explorer) and analyze them using the power of dotMemory. 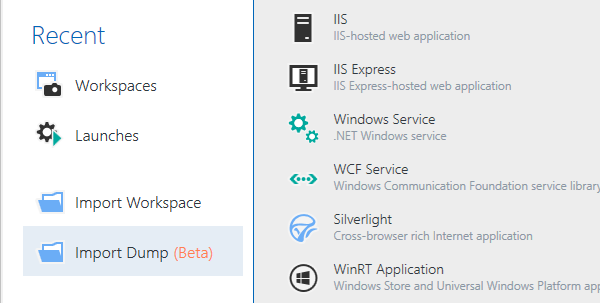 This feature is currently in Beta status: although it's 100% functional, we were simply unable to test it on all possible combinations of Windows and .NET Framework versions. It's still possible that on some of these combinations, dotMemory won't show you all expected data in the resulting snapshot. 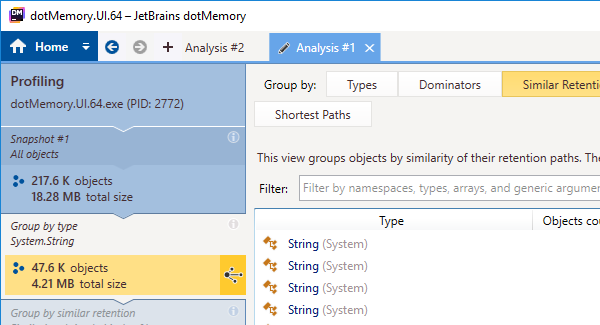 The dotMemory user interface was slightly redesigned to make navigation through analysis subjects and views easier. An additional benefit of this effort is the increased views area. The Dominators view was reworked to make it easier to reveal key objects in your application. The tree of dominators is now combined with the dominators sunburst chart. dotMemory 2017.1 includes the dotMemory.exe tool that allows you to profile from the command line. The tool is extremely helpful when you need to automate the process of gathering memory snapshots, e.g. if you want to make profiling a part of your continuous integration builds. dotMemory 2016.3 checks your application on finalized objects and objects queued for finalization. A new inspection shows such objects on the snapshot overview page. 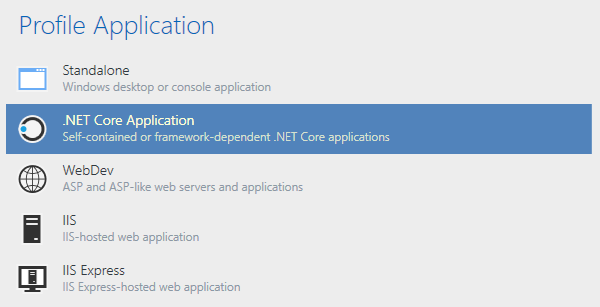 Now, if you have .NET Core tools installed on your computer, you can profile .NET Core applications without any additional effort. The workflow is pretty straightforward. 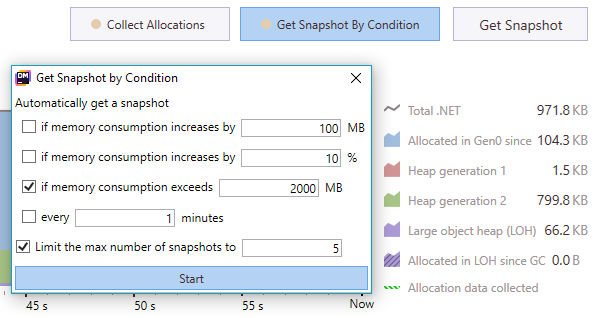 Simply select .NET Core Application on the Home page, specify the executable and click Run. dotMemory 2016.2 allows you to compare memory snapshots stored in different workspaces: that is, collected in different profiling sessions. This can be useful to find out how particular changes in code affect your application's memory usage. All you need are two snapshots taken before and after committing changes. Refined APIs to work with unit testing frameworks that are not supported out-of-the-box, such as new arguments accepted in DotMemoryUnitController methods TestStart() and TestFailed(). You can now place any number of AssertTraffic attributes before the test and filter traffic by any set of conditions. GetNewObjects, GetSurvivedObjects, and GetDeadObjects methods receive overloads that accept query as a parameter. This helps avoid an additional GetObjects call and simplify assertions. You can use three constants when specifying a directory for saving workspaces in the DotMemoryUnit attribute. The constants are written in angle brackets: <User>, <LocalAppData>, <CommonAppData> and stand for %USERPROFILE%, %APPDATA%, and %LOCALAPPDATA% directories, respectively.